I am so excited to tell you about this super cool cat craft. It’s not just any cat… it’s Pete the Cat! Don’t you just love the Pete the Cat books ? 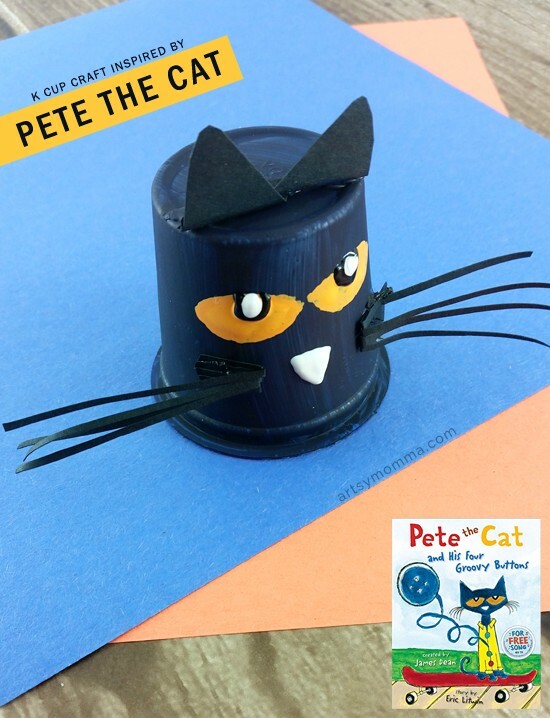 Well, take a look at the k cup Pete the Cat craft that we made with just a few art materials. It is perfect to make with kids of all ages. *This post contains affiliate/referral links. Please read our full disclosure policy here. Make this Pete the Cat book-inspired craft to have your kids hold while you read the Pete the Cat and His Four Groovy Button book aloud. They will have so much fun and they can even act out the stories in the books with their awesome k cup character! Buy the book on Amazon. Recommended for kids ages 4-8. We love this book! We especially like to watch the singing read aloud on YouTube. If you aren’t familiar with this book, definitely check it out with the kids. Be warned though…. you will have the song stuck in your head for days. It’s so catchy and fun! → Printable activities to go along with Pete the Cat and His Four Groovy Buttons. 1. Mix a drop of black paint in with the dark blue, but don’t blend completely. 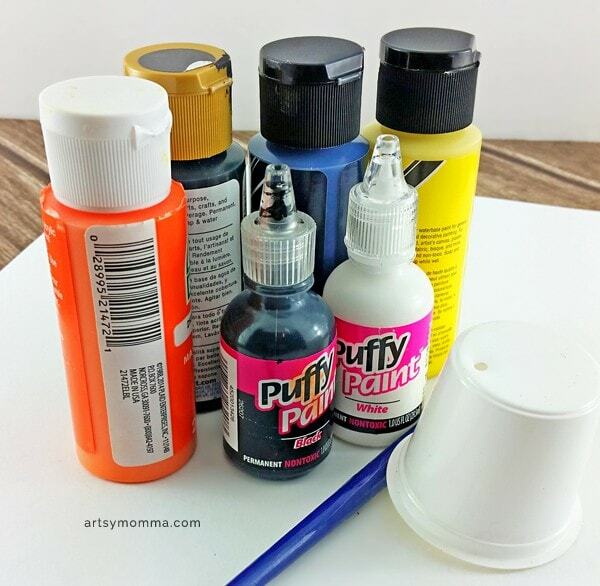 Paint the entire outside of the k cup with this mix and allow it to dry. 2. Cut two triangle shapes from black construction paper for ears. Fold a small portion of one side back to make a gluing surface, then attach with hot glue. Reshape the ears if necessary, I had to! 3. Mix a little bit of orange with yellow to make the eye color. Once dry, use the white puffy paint for pupils and nose, then black puffy paint to outline the pupils. 4. Cut two long, thin rectangles of black construction paper. Make thin cuts in them to create whiskers. Attach with hot glue. The great thing about Pete is that his character is pretty forgiving to make. He isn’t “perfect” to begin with! 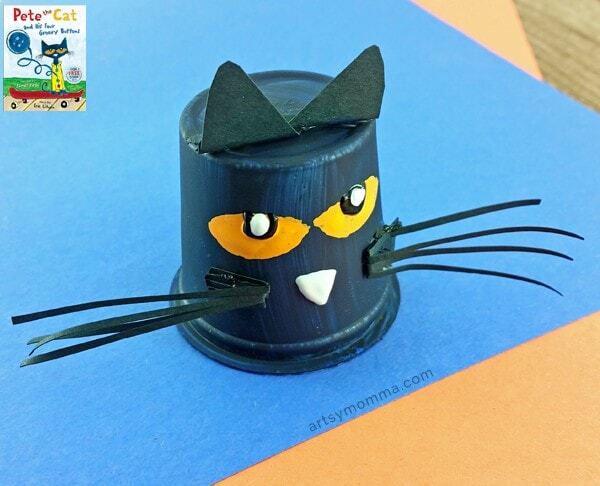 Thanks for joining us for the recycled k cup Pete the Cat craft tutorial!